It’s a fascinating debate. The three time MVP against the three time MVP. Alex Rodriguez or Albert Pujols. It’s not even worth it to talk about which player you would rather have on your team, because both are incredible. But, a good question would be: When it’s all said and done, who will have had the better career? So, let’s answer it by looking at the home run totals of both of these players. Here is a graph showing the home runs totals by age for each of these players. A-Rod had the head start. That in itself already gives you the idea that A-Rod is the more incredible player. Pujols came in at 21, like most great players. A-Rod came in at 18, like most historic, iconic players. Pujols did get off to a quicker start though. In Pujols first season, he hit 37 home runs, quickly bringing his total to half of A-Rod’s, who had already been playing for three years. 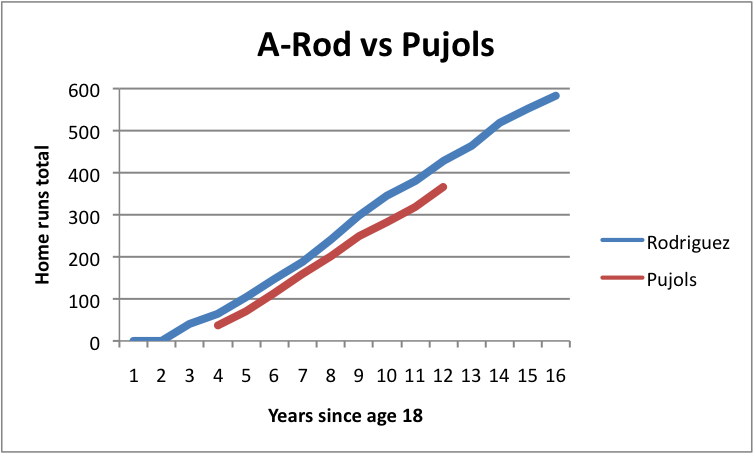 For the next four seasons, Pujols kept pace with A-Rod. In fact, they both stayed at a somewhat constant rate. The next season, though, A-Rod spiked up, and continued to do so, while Pujols stayed at the same rate. Since A-Rod is older, we already know what he has done. He has continued to stay at the same rate after that spike around age 28. So, if Pujols is going to catch A-Rod, his is not only going to need to keep up his own rate, but he’s going to need to throw in either a good 70 home run season, or a couple 50 home runs seasons. For a guy that has never hit 50 home runs in his career, that’s going to be tough to do. So, to all of the people who say that Pujols will pass A-Rod, you better hope he’s got a record breaking season in him. The choice is yours, who’s the better player? Keep in mind that Pujols is in a much weaker division than A-Rod is in, so he faces worse pitchers. But also remember that Pujols is in a much weaker line-up, so he gets pitched around more than A-Rod does. And most importantly, A-Rod has done this for seven more seasons, it’s not a sure thing that Pujols can keep this up for as long as A-Rod has. Buster Olney says in a video blog, that he feels Damon will end up in New York because “he’s running out of other options.” He mentions that the Braves, Giants, and Tigers have pulled out of the race, making the Yankees chances even greater for obtaining Damon. He says that two things would have to happen, one being that “Damon would have to greatly reduce his salary demands,” and the other being that “Hal Steinbrenner would have to essentially rewrite his budget.” He adds that sources tell him that Hal is unlikely to do that, although many team executives say that they think Damon will end up in New York. Anthony DiComo says via the Hot Stove Blog that a report yesterday about Baldelli signing with the Yankees was incorrect, according to Brian Cashman. He adds that the Yankees are still very interested in Baldelli, should Damon not work out. With everyday Damon remains a free agent, I struggle to understand where things went wrong. With the thought of the game changing, season changing steal of two bases in the World Series, it’s hard to think that that player would have so much trouble finding a team. There are a few interesting pieces of information today, all of which lead me to believe that a Damon return to New York may not be impossible. The two front runners for Damon as of yesterday were the Tigers and Braves. Today, we learned that they are very weak front runners. The Braves have reportedly pulled out of the race for Damon, unless it was for $1-2M. The Tigers GM also said that they have not expressed any interest in Johnny Damon. Add all of that to the fact that the Mets signed Jerry Hairston, and you have a set up for a Damon return. The Braves could offer $1-2M, but the Yankees have that much available too, and Damon would pick New York over Atlanta. Should this come down to the wire, I wouldn’t be surprised for both sides to compromise, and for a one-year, $4-5M deal to surface. Just putting that out there. There’s no evidence of that yet, but the stage is certainly set for it. It’s pretty simple. 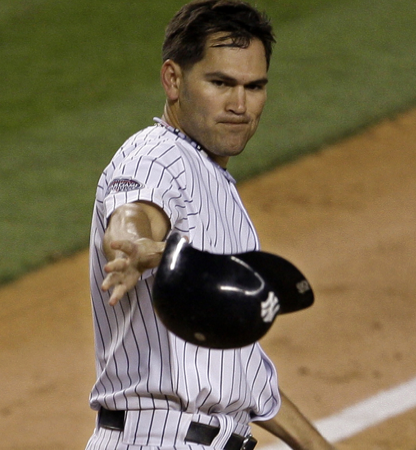 Johnny Damon — or more likely Scott Boras — is asking for too much money. The Yankees, especially after winning the World Series, do not want to go crazy spending money. All off season, the Yankees have repeatedly said that they had a budget they wanted to stick to. And while the Yankees spending ways may make that budget seem irrelevant, changing times may actually make it a reality. The NY Post has learned that the Yankees had a completed deal for Brewers outfielder, Mike Cameron, last July, but decided to scratch the deal because of the extra $5.5 million that it would add to the payroll. That may seem surprising to Yankee fans. Since when does $5.5 million matter to the richest team in baseball? It started when Hal Steinbrenner took over the Yankees. It is clear that Hal is a lot more responsible about spending than his father, George, was. In this case, the Yankees say they have $2 million left. Damon will most certainly not bring that number down. And for that reason, coupled with Hal — not George anymore — behind the owners desk, you can pretty much scratch Damon off the list. And to those of you who look to last seasons spending spree as hope for a Damon return, let me bring something up. Last year was the first time the Yankees didn’t make the playoffs in over 10 years. The Yankees just won the World Series, so you can count out another spree. Jeff Passan of Yahoo! Sports has now confirmed (via Twitter) that the Reds have signed the Cuban lefty, Aroldis Chapman, to a five-year deal worth $30 million. The Angels and Blue Jays were long thought to be the front runners, with the Marlins and Red Sox also in the mix. Chapman, 22, will join a highly talented and young staff that includes Edinson Volquez, Johnny Cueto, and Aaron Harang. 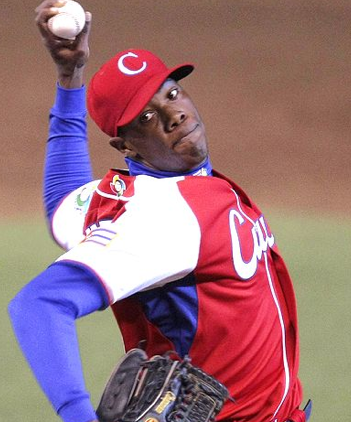 Chapman burst onto the scene in the 2009 World Baseball Classic, when he struck out eight batters in six and a third innings pitched for the Cuban team, despite going 0-1 with a 5.68 ERA. The lefty also went 11-4 with a 4.03 ERA in 2008-2009, striking out 130 in 118 1/3 IP. As many as 15 teams went to see Chapman pitch in Cuba earlier this offseason, one of which was the Yankees. Among many perks, teams were most impressed by his triple digit fastball. From a Yankee perspective, you can just be happy he didn’t end up within the divison. The Yankees were never really serious about him anyway. You can also be happy he didn’t end up on the Angels, which were for a long time the front runners. But, to every team and fan in Major League Baseball, I think we can all now be worried about this staff out of Cincinnati. If you ask me, there is no younger more talented group of pitchers. Props to the Reds officials for putting that together. 12:59 p.m. According to a tweet from Jeff Passan of Yahoo! Sports, Aroldis Chapman has signed a $30MM deal with an unknown National League team. 1:03 p.m. Looking back at some reports, it looked as though the main suitors for Chapman were AL teams (Angels and Blue Jays.) But according to SI.com’s Jon Heyman, the Marlins and Nationals were two NL teams interested. Marlins offered $16MM, so it’s unlikely they brought that offer up to $30M:M.
1:26 p.m. Jeff Passan said in the same tweet that Chapmans plane landed in Ft. Lauderdale this morning. That would be an indication that it would be a Florida team. Marlins are the only NL Florida team. 1:28 p.m. Jeff Passan of Yahoo! Sports says in another tweet that Chapmans plane left Ft. Lauderdale at 9:20 this morning en route to Cincinnati. Another source told him that the $30MM is for five years. 2:07 p.m. Buster Olney tweets that the Padres and Dodgers are not the team that signed Chapman. He adds a little later that the Rockies and Braves are also not the team. Buster also adds that the Mets have been out of the running. 2:23 p.m. ESPN.com now reports that Chapman is close to a MLB deal, but it is not yet complete. Chapmans representatives told ESPN.com that the Reds were “possible” although no deal was completed. One source also told ESPN The Magazine’s Jorge Arangure that the team is the Reds. 2:51 p.m. Jeff Blair says (via Twitter) that he hears Chapman has finalized a five-year, $30MM with the Reds. Updates will come as more information becomes available.